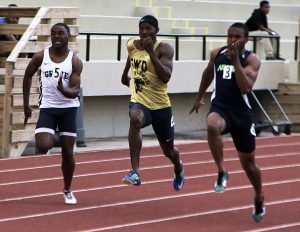 The defending Class 3A state champions Cedar Grove Saints rallied from a six-point, first day deficit to overtake Westminster 181-169 for the Region 5-3A track title on Monday at Westminster. Westminster held a 70-64 lead after the field events held on Saturday despite three gold medals by the Saints. Cedar Grove’s Raquan Bonner won the high jump (5-08.00), Kortney Cox won the triple jump (43-00.00) and Netori Johnson captured the shot put (45-06.00) to keep the Saints within striking distance going into Monday’s track finals. Cedar Grove’s Marcus Allen, Kortney Cox, Israel Spivey and Barry Williams teamed up to capture the 4×100 relay (41.92) gold medal and coupled with a fourth place finish by the second Cedar Grove entry in the event pulled ahead of Westminster. Spivey and Cox were the fastest runners on the track on Monday as they finished 1-2, respectively, in both the 100 and 200 meter dashes. Spivey ran a 10.80 in the 100 and 21.88 in the 200 while Cox was just behind at 10.98 in the 100 and 22.07 in the 200. Jadon Haselwood swept the hurdles winning the 110 meters in 14.95 and then taking the 300 meters in 40.84. Barry Williams was third in the 110 (15.99) and second in the 300 (41.74). The Saints capped the championship off with a 1-2 sweep of the 4×400 meter relay. Terrence Lewis, Deanthony Moore, Israel Spivey and Matthew Young took the gold with a time of 3:20.43. McNair’s DeMarshae Travis brought home the gold in the long jump with a leap of 21-06.00. The Cedar Grove Lady Saints gave a valiant effort to finish second to Westminster, but could not overcome the 35 points deficit to finish second 162-151. Antania Swain won the discus (96-09.50) and Mynaisha Mitchell took the high jump (5-02.00) as Cedar Grove picked up a pair of gold medals during the field events day. Tyra Collum swept the 100 (12.49) and 200 (25.56) meter dashes as the Lady Saints tried to close the gap on Monday. More help came from Bobbi Turner with the top finish in the 100 meter hurdles (16.04) and Kayla Blagmon in the 300 meter hurdles (47.25). Stone Mountain’s Toni Pellington struck gold twice winning the long jump (17-00.50) and the triple jump (34-06.00).